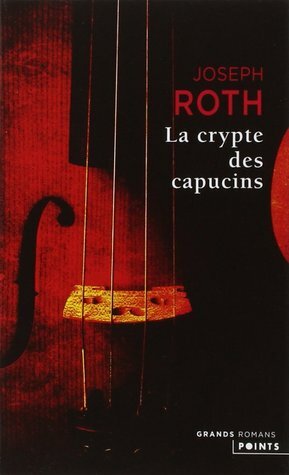 The Emperor’s Tomb by Joseph Roth (1938) French title: La crypte des capucins. Translated from the German by Blanche Gidon. Nous avions tous perdu notre position, notre rang, notre maison, notre argent, notre valeur, notre passé, notre présent, notre avenir. Chaque matin en nous levant, chaque nuit en nous couchant, nous maudissions la mort qui nous avait invités en vain à son énorme fête. We all had lost our position, our rank, our house, our home, our money, our worth, our past, our present and our future. Each morning when we got up, each night when we went to bed, we cursed death who had invited us in vain to her grand party. The Emperor’s Tomb (1938) is a sequel to The Radetzky March (1932). You don’t need to have read the first one to read the other but both feature the same Trotta family. The Radetsky March takes us from the 1860s to 1916, the year the Emperor Franz Joseph died. Roth pictures the tragic fate of the Trotta family, a fate that is linked to the slow death of the Austro-Hungarian Empire. He shows how rotten the Empire had become and how ready to collapse it was. Then The Emperor’s Tomb pictures the Trotta family after the collapsing due to WWI, during the fragile First Austrian Republic up to the Anschluss in 1938. It begins in April 1914. Franz-Ferdinand Trotta is 23. He’s young, idle and spends his nights drinking and partying with his friends. He’s living a dissipated life and barely sees the sun because he only lives at night. He’s influenced by his friends, he wants to fit in so badly that he represses his true self. He doesn’t openly court Elisabeth, one of his friends’ sister, because it was not fashionable to be in love. He’s carefree to the point of carelessness. He’s totally unprepared for adult life and he’ll have to grow up quickly because his life is about to change. Franz’s father has just died and left some money to Joseph Branco, a cousin of the peasant branch of the Trotta family, the one still living in Slovenia. Branco is a farmer during the summer and a travelling chestnut seller during the winter. Franz-Ferdinand welcomes him with open arms, somehow glad to be with someone who is a link to his countryside roots. During his winter travels around the Empire, Branco has befriended a Jewish coachman from Galicia. His name is Marès Reisiger and he has a son who wants to study music in Vienna. Franz calls for a favor and the young man gets in his music school. A bond is formed between Franz, Branco and Reisiger, strong enough for Franz to go to Galicia during the summer 1914. That’s where he is when WWI starts. He comes back to Vienna to join his regiment, marries Elisabeth in haste and in fear of not coming back and leaves town. He quickly asks to change from his designated regiment to a less prestigious one to be with Branco and Reisiger. They are quickly captured by the Russian army and spend the whole war in a prisoner camp in Siberia. Back to Vienna, Franz tries to adapt to the new reality of his life. Everything he knew has fallen apart. The Austro-Hungarian Empire is dead. His wife is a stranger. His mother is ageing and declining. He has no trade and is unfit to earn any money. His fortune is vanishing quickly, due to poor investments and the economic situation of the country. Franz is a disarming, charming and yet infuriating character. His candidness is endearing and he doesn’t try to hide his flaws. He’s not class-conscious and doesn’t look down on Branco. He never makes fun of him, even when he takes him to breakfast in a posh café in Vienna and he asks for soup because that’s what he eats at home. He’s not ashamed of him and he even envies him in a way. Branco knows his place in the world, in the society. Franz partially died when the empire fell. He’s a man from the past and he has trouble adjusting to the moving reality. Roth describes a feeling of disorientation and loss. Franz has lost his identity. He feels “ ‘extraterritorialised’ from the land of the living.” Franz is nostalgic of monarchy made of different countries and people, patched up into an empire through administrative and everyday life landmarks, like the railway stations and the post office. There are no borders and things feel familiar everywhere he goes. You could say that it is the beauty of colonialism seen from the side of the colonizer and that the people of the Austro-Hungarian empire certainly didn’t feel that way. But Roth argues through Franz that the Empire collapsed because it failed to see that the people from the Slovenia, Galicia, Romania, etc. were its wealth thanks to their diversity. Vienna made the mistake to turn to their German roots instead of embracing the vitality and diversity of the people of the Austro-Hungarian Empire. The Interwar period in Vienna sounds similar to the Interwar period in Budapest described in books by Zsigmond Móricz or Dezső Kosztolányi even if the description of the political context is not the aim of their books. Contrary to The Radetsky March, The Emperor’s Tomb is a first-person narrative. Franz talks to us, bares his soul and lets us in. He shows his helplessness. He knows he’s not equipped to survive properly in this new world. He tries to stay afloat and live one day at a time. He’s oblivious to the changing political context, he’s too focused on what he lost. He’s like the frog who is in a water bucket and the temperature of the water increases, increases, increases and the frog is dead before it realized it was time to leap out of the water. The Emperor’s Tomb is really moving even if I wanted to shake Franz and urge him to live his live instead of suffering through it. But Franz, like the monarchy he was born under, is an oak with old roots. And oaks, like Lafontaine told us, do not bend like reeds when the wind is too strong. They get uprooted and die. There would be a lot more to explore about this book, about its form and its substance. I didn’t write anything about its style but it was exceptional. I have read The Emperor’s Tomb in an excellent French translation by Blanche Gidon who knew Roth when he was exiled in Paris in the 1930s. My paperback edition includes a good foreword by Dominique Fernandez and a touching afterwords by Blanche Gidon about her last meeting with Roth and her take on The Emperor’s Tomb. There’s an English translation by Michael Hoffman, and I heard from you all that he’s a good translator. 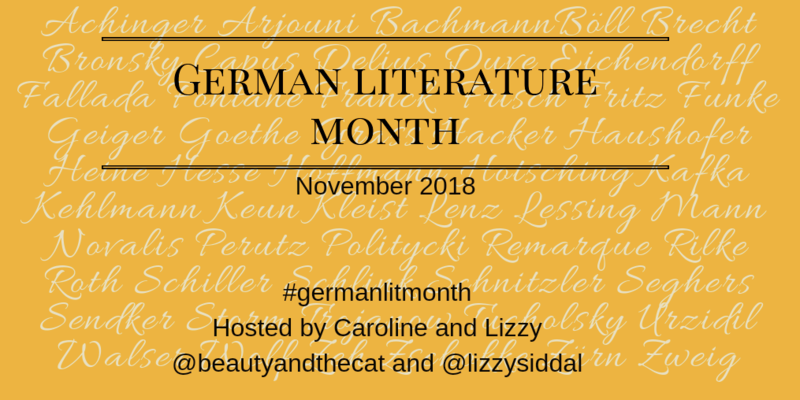 This was my second contribution to Caroline’s and Lizzy’s German Lit Month. I had The Emperor’s Tomb by Joseph Roth on my shelf and I’m happy that Lizzy’s readalong pushed me to read it at last. I really had a good time. I couldn’t put it down. The Radtesky March is cold as a military march. This one is poignant as civilian music. I’m looking forward to reading your thoughts, it’s always great to do a readalong and discuss with someone who has all the details of the book in mind. I will return to your post once I finished the book. Hopefully before the end of the week. I like it very much so far. Thanks. Looking forward to reading your thoughts. It’s a totally different style. Fair warning after your response to The Kites: do not expect historical accuracy in the part about WWI. Take it as a tale and you’ll probably enjoy the ride. Beautiful review, Emma! I loved the way you have described Franz’ character – how he treats Branco well and is not class conscious. Franz seems to be a fascinating character – likeable, kind, imperfect, flawed, real. I read a book sometime back called ‘Summer Before the Dark’ by Volker Weidermann, in which he describes the Austria of that time – how it is diverse and it looks like a conglomeration of nations. It is nice to know that ‘The Emperor’s Tomb’ also touches on that. I loved what you said about how LaFontaine differentiates between an oak and a reed. Thanks for sharing your thoughts. Thanks Vishy, there’s a lot to say about this novella. I liked Franz’s voice because he sounded real and he was vulnerable. It is a fascinating period to explore. I loved this billet, Emma! I read Roth’s Hotel Years recently and loved his prose style, so I’m interested in this one. Maybe I’ll start at the beginning, though, with The Radetzky March. The name Franz-Ferdinand made me think instantly of the Archduke, which I suppose was Roth’s intention? The character certainly sounds heavily identified with the Empire. I was reading about the real-life Franz Ferdinand recently in “Black Lamb and Grey Falcon”, and he sounded quite similar in his stubborn rootedness and inability to change. The Trotta family owes its fortune to the special relationship with the monarchy. You’ll see that in The Radetsky March. So yes, the name is a reference to the archiduke, the monarchy and the event that will end their world. The emperor Franz-Joseph was already very conservative in 1848, I don’t imagine that this trait of character improved with age and I supposed he was set in his ways. He reigned during 68 years, I don’t think anyone can be in power so long and always keep in touch with the people and feel the changes in society. I hope you’ll review both The Radestky March and The Emperor’s Tomb if you read them.